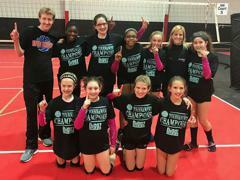 It is the goal of Epic United’s youth programs to help spread the love of volleyball throughout our community. All of our youth programs are designed to shrink the game of volleyball to the child's size, using lighter balls, lower nets, and smaller courts. This allows boys and girls to learn proper technique and love the game without getting frustrated. Youngsters develop athletic skills through volleyball that will enhance their ability to play all sports. In addition to volleyball fundamentals such as serving, passing, setting, hitting & rules of the game, participants will improve hand-eye coordination, balance, body awareness, footwork, agility, spatial awareness and communication with an emphasis on "FUN"damentals and TEAMWORK. Many youth program alumni have moved on to very successful careers with Epic United, DEVA, and Altitude Travel and Travel Elite teams. The classes are currently offered in 3 areas: Our Eastern sessions will take place in Merrillville and Hobart, our Western sessions will take place in Lansing, IL and Munster, and our Southern sessions will take place in Crown Point. We are also looking at adding sessions at Marian Catholic High School soon. Please contact Alex Sullivan with questions at alex.sullivan8@comcast.net or 708-285-0999. Stay tuned for our summer camp opportunities! We will have a summer volleykids camp as well. Stay tuned!